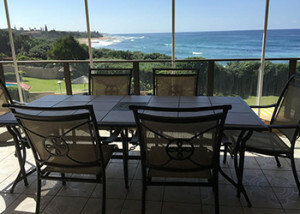 At Last Shelly Beach is a large self-catering cottage located on the owner’s property, situated near to the beach in Shelly Beach. The property is also within close proximity to Shelly Centre. This fully furnished unit has a private entrance and consists of 3 bedrooms and 2 bathrooms. Each bedroom is equipped with a queen-size bed, and there is a bunk bed in the living area for 2 children. The well-equipped kitchen contains a fridge, a microwave, an oven with a stove, and built-in cupboards. The open-plan lounge has a TV with DStv connectivity, so guests can bring their own smart card and decoder. The lounge also leads out to an enclosed balcony. There is also a private braai area for guests. Separate off-street parking is available for 1 car. The host will be on hand to assist guests with check-ins. 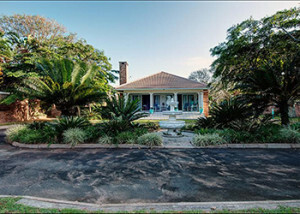 The property is ideally situated 1.5 km from the South Coast Mall, and a drive from Margate Main Beach and the area’s attractions. Libra 3 is situated in a seafront security complex located in Manaba Beach. The unit is within walking distance of the beach. The 3-bedroom apartment features 2 bathrooms, a living area with sea views, a well-equipped kitchen and a spacious balcony. The main bedroom contains a queen-size bed and en-suite bathroom with a bath and double shower. The second bedroom has 1 double bed and the third bedroom contains 2 single beds. The second bathroom is shared and features a shower. The kitchen is equipped with a fridge-freezer combination, stove, oven, kettle, microwave and toaster. 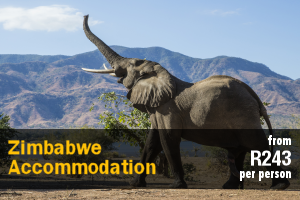 Additional facilities include a Weber braai, air-conditioning, TV, DVD, a dishwasher and washing machine. A swimming pool and roofed parking area are available in the complex. Activities nearby include swimming, fishing, kitesurfing, canoeing, windsurfing, golf and river rafting. 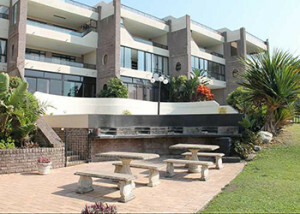 Indigo 11 is located in the secure Indigo Bay complex, in a quiet area in Margate. 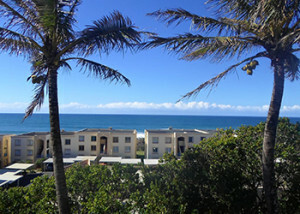 The complex is located in Margate’s golden mile with the swimming beach on the right and Manaba swimming beach on the left. The first-floor apartment can accommodate up to 6 guests and comprises 3 bedrooms, 2 bathrooms, and an open-plan kitchen and living area. The first bedroom has a queen-sized bed and an en-suite bathroom. The other bedrooms are each furnished with double beds. The main bedroom has views of the ocean. The kitchen is fully equipped for self-catering with a stove and oven, fridge-freezer, microwave, as well as a washing machine, tumble dryer and dishwasher. The comfortable lounge area contains a flat-screen TV. 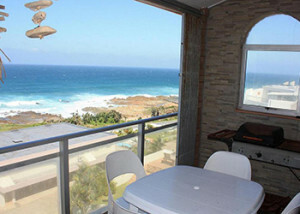 The apartment also has a balcony with a gas braai and ocean views. The Indigo Bay complex offers a communal swimming pool and braai area, as well as secure undercover parking for 2 vehicles. 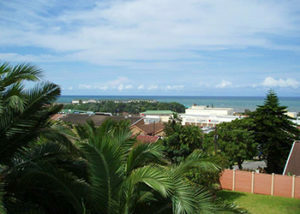 This modern, newly renovated apartment offers self-catering accommodation in the seaside town of Uvongo. 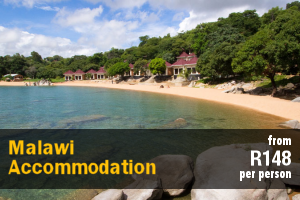 The unit is nestled on the banks of the Uvongo River and is ideally located near the beach. 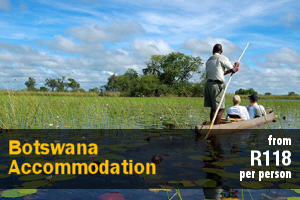 Uvongo Cottage accommodates 4 guests and comprises a 1-bedroom apartment with views of the river. The bedroom is furnished with a double bed while the en-suite bathroom has a shower. A sleeper couch is available in the lounge. The kitchen is well-equipped to cater to guests self-catering needs while additional facilities include a swimming pool, TV, braai area and secure parking. Guests can enjoy activities such as swimming, snorkelling, fishing, surfing, birdwatching, cycling, hiking and golf in the area. The property also boasts a Jacuzzi with seating for 8 guests. 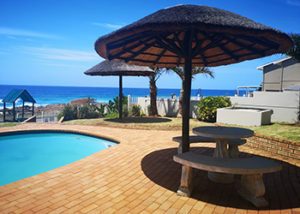 Seascape Lodge 38 Uvongo offers cosy self-catering accommodation situated on the first floor of a secure complex in Uvongo, just 800 m from Uvongo’s main beach and 7 minutes from Shelly Beach. The lock-up-and-go self-catering apartment which can only accommodate 4 adults and 2 children and is comprised of a main bedroom, a bathroom, and an open-plan living, dining and kitchen area. The main bedroom contains a double bed, the bathroom contains a combined shower and bath, the open-plan living area contains a single bed and a bunk bed, and the open-plan kitchen is equipped with a fridge, oven and stove, microwave, a kettle, and cutlery and crockery. 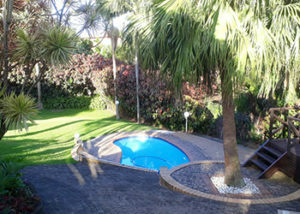 The apartment has access to undercover parking, and guests have access to a communal swimming pool and braai facilities. 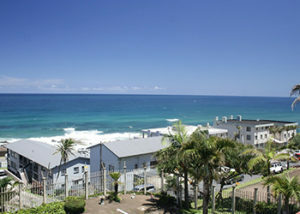 Seascape Lodge is situated within close proximity to a Spar grocery store and a seafood restaurant. The laidback seaside resort town of Uvongo is located on KwaZulu-Natal’s Hibiscus Coast. Visitors can enjoy lazy days on the beach, explore animal sanctuaries, visit restaurants, shops, nature reserves, and golf courses. Nearby attractions and activities include the Sardine Run, between May and July, Uvongo Nature Reserve, Oribi Gorge Nature Reserve, Riverbend Crocodile Farm, Skyline Nature Reserve, and South Coast beaches. 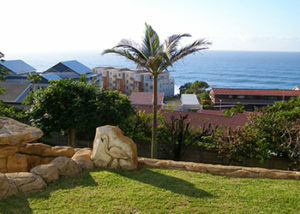 Villa Homestead Flat-let is a cosy, 1 bedroom, self-catering flatlet that is located in Margate. The unit has 180-degree sea view as well as a large, open garden area. Accommodation has a sleeping area with a double bed and a sleeper couch that can accommodate 1 child under 12 if need be. The sleeping area leads into a kitchenette that is equipped with a fridge-freezer combination, microwave, countertop oven, toaster, and kettle as well as a wash-up area. There is an en-suite bathroom that is fitted with a shower and toilet. There is also a TV with Open View channels available. Establishment facilities include a braai area and secure undercover parking behind locked gates. Margate is situated on the seaside of KwaZulu-Natal and is famously known for its beautiful beaches, snorkelling, and surfing. It is considered a popular spot, where many tourists come to spend their vacation. Nearby attractions include restaurants, pubs, nightclubs, local shops, and the beautiful South Coast beach. 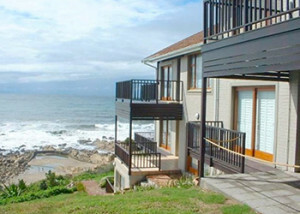 The Beachfront Unit 8 is a comfortable self-catering apartment in a small 12 unit complex. The security complex is situated on the beach front with amazing views. Main Blue flag beach is within walking distance. The unit has 2 bedrooms and 1 bathroom, and a separate shower. It is fully equipped and has an open-plan kitchen with a counter and chairs. The lounge has a DStv connection and decoder with fifty channels available. Towels are not provided, so please remember to bring your own. 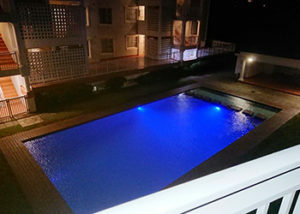 The unit has a large enclosed balcony overlooking the swimming pool and beautiful breaker sea view. Free fixed line internet with Wi-Fi on premises. There are 24 hour surveillance camera’s and a lock-up garage with an additional parking bay. 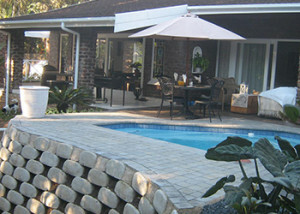 Enjoy the beautiful tranquil cycad filled garden with ample braai facilities. The security complex offers a garden, a communal swimming pool, as well as direct access to the beach. 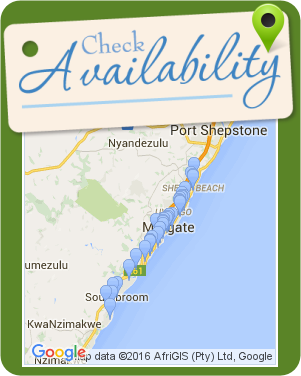 Ramsgate’s main Blue Flag beach is situated approximately 2 km away. There are restaurants and shopping centres situated within a 3 km radius for guests convenience. Rock-A-Way 9 is a comfortably furnished self-catering apartment for up to 5 people in Lawrence Rocks. The apartment consists of 2 air-conditioned bedrooms and 2 bathrooms. The main bedroom has a queen-size bed, as well as a TV with full PVR DStv. The second room contains a single bed, as well as a bunk bed. Linen and towels are provided, and guests please need to bring their own beach towels. The open-plan kitchen is equipped with a stove and oven, a microwave, a double fridge, a dishwasher, a washing machine, a tumble-dryer, as well as a water purifier. 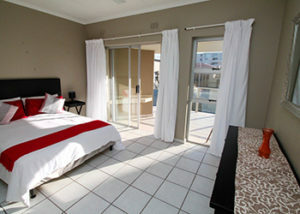 The air-conditioned living area has a TV with full PVR DStv, and opens onto a balcony with a gas-braai and dining area. Communal braai facilities are also available in the complex. Please note smoking is not allowed in the unit, and unfortunately, pets are not allowed. A lock-up garage is available for use, and a daily cleaning service is available at an additional cost. Rock-A-Way 9 is approximately 300 m from the closest beach, and 500 m from the Margate main beach. The area offers a variety of activities such a surfing, swimming, mountain biking as well as various attractions and restaurants. 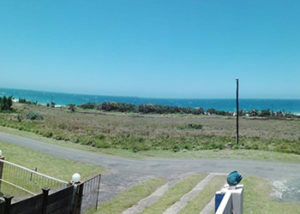 Branderkant 7 is situated in the holiday town of Ramsgate on the South Coast of Kwa-Zulu-Natal and offers quality accommodation, ideally suited for a family. The apartment is nearby numerous shops, restaurants, activities and the beach. The double-storey apartment comprises 2 bedrooms and 2 bathrooms. The main bedroom has a double bed and the second bedroom has 2 single beds. There are a separate toilet and a shared bathroom with a bath, shower, toilet and basin. There are 2 extra matrasses than can be used for additional guests. The kitchen is equipped with a stove, oven, microwave and fridge, as well as all crockery and cutlery guests will need. The lounge has comfortable couches and a TV with a premium DStv package. The flat has access to a private beach less than 50 metres from the front door, and there are many restaurants within walking distance. Please note that the unit is a double story and has stairs. 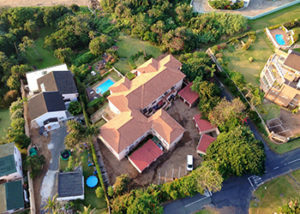 Stafford Place 6 is situated in an apartment complex located in the coastal town of Uvongo on the Hibiscus Coast of KwaZulu-Natal. The self-catering apartment comprises 2 bedrooms, 1 bathroom, an open-plan living area and kitchen. The main bedroom contains 1 queen-size bed and the second bedroom has 2 single beds. Both rooms are equipped with air-conditioning. The shared bathroom has a bath and shower. The kitchen area is equipped with a fridge-freezer, microwave, stove, oven, toaster and kettle. 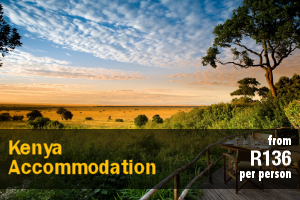 Additional facilities include a braai area, TV with full DStv, washing machine, tumble-dryer, air-conditioning in the dining room and lounge area. and covered parking in the complex. A communal swimming pool is available in the complex. Activities in the area include swimming, surfing, snorkeling, fishing, hiking, shopping and golf. 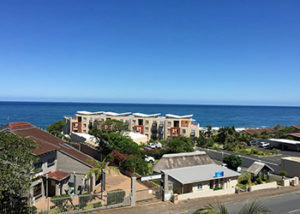 The Court House is a self-catering apartment located in the Ramsgate Beach area, just south of Margate, on the south coast of KwaZulu-Natal province. The small complex is situated directly on the river and it’s just a short drive down to the beautiful Ramsgate Blue Flag beach. The setting is a birder’s paradise including strutting peacocks, avocado and pawpaw trees; and a sparkling swimming pool. This 2-bedroom apartment is tiled throughout and able to accommodate 4 people and there are 2 bathrooms. The main bedroom has a double bed and an en-suite bathroom. The second bedroom has 2 single beds and a separate bathroom. The unit is serviced from Monday to Thursday and linen is provided, but you will need to bring your own bath and beach towels. The complex is fully walled, fenced and has an electric gate. Secure parking is provided and the unit is alarmed. There is a hairdryer and multi-plug adaptor provided for your convenience. This is strictly a non-smoking apartment. The world famous Waffle House, a whale viewing deck and several gourmet restaurants are just around the corner. 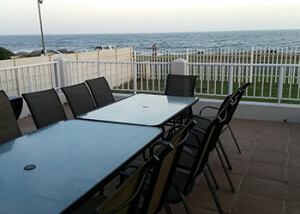 The Beach Front Unit 11 is a very comfortable self-catering apartment in a small 12 unit complex. The security complex is situated on the beach front with amazing views. The unit has 3 bedrooms and 2 bathrooms that can accommodate 5 guests. It has a fully equipped a kitchen and the lounge has a DStv connection which offers 50 channels. Towels are not provided. There is 24 hour surveillance camera’s and a lock up garage with an additional parking bay. Free fixed line internet with Wi-Fi. Pets are not permitted. The complex offers a garden with ample braai facilities as well as a communal swimming pool. The property is located close to blue flag main beach as well as various shopping centres, restaurants, banks, and post office – all located within a mere 3 km radius. 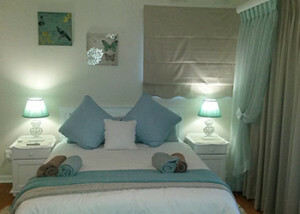 Dolphin View 503 is a self-catering holiday apartment located in Lawrence Rocks, Margate. At the heart of the Hibiscus Coast, Margate is famous for its beautiful beaches, natural forests and subtropical climate. For many, it is simply their go-to spot for a great summer holiday. Apart from the beaches, Margate also offers some of the best snorkelling and diving in South Africa. The apartment can accommodate up to 4 guests and comprises 2 bedrooms, 1 bathroom, and an open-plan kitchen and living area. The main bedroom contains a queen-size bed. The second bedroom contains 2 single beds. The bathroom is fitted with a bath and a shower, a toilet and a washbasin. The kitchen is fully equipped for self-catering and contains a stove, oven, fridge-freezer, microwave, and cutlery and crockery. There is also a washing machine available. The dining area has seating space for 6 people, while the lounge has a comfy lounge suite and a flat-screen TV with a DStv access point. Please bring along your own decoder and the smart card to make use of this. The living area opens up on to a lovely balcony with built-in braai facilities. Guests need to bring their own towels. Laguna La Crete 74 is a modern apartment with FREE WiFi and DSTV, and stunning views over the beautiful Uvongo beach and lagoon with its famous gorge and waterfall. The unit is tiled throughout with marble counter tops in the kitchen, bathrooms and on the balcony. 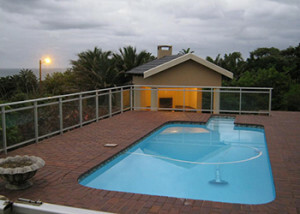 It is on the top floor and has stunning views over the Uvongo gorge, lagoon and beach. The unit has 3 bedrooms and 2 bathrooms and caters for a maximum of 8 people. 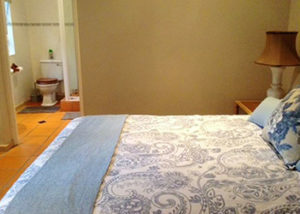 The main bedroom has a double bed, a safe in the wardrobe and an en-suite bathroom with corner bath, toilet and basin. The second and third bedrooms have tri-bunks; a double bed at the bottom with a single bunk on top – they share the second bathroom which has a toilet, basin and large shower perfect for bundling all the kids into after a day on the beach. The bedrooms are all fitted with remote-controlled ceiling fans. The modern open plan kitchen is very well equipped with everything guests could need. Larger than usual sets of crockery and cutlery ensure that guests won’t spend their holiday washing dishes. The unit has a dishwasher, ice machine and washing machine and dryer for guests convenience. Daily cleaning service can be arranged. The lounge suite is very comfortable and includes 3 bean bags for the kids. Like the bedrooms, the lounge is fitted with a ceiling fan. Mobile standing fans ensure that you will keep cool even on the hottest days. For your entertainment, there is a large LCD TV, complete with DSTV Premium at no additional charge, DVD player and radio/CD player. There is also a second TV in the 3rd bedroom; again with DSTV. We also offer FREE WiFi. The spacious balcony, accessible from either the lounge or main bedroom, features an 8-seater dining table, a gas BBQ, a patio lounge suite and a set of two sun loungers. Breathtaking sunrises are guaranteed from this vantage point for the early risers. The unit includes secure covered parking for 1 vehicle; additional uncovered and separate trailer parking is also available. All linen and bath towels are provided but please bring your own beach towels. This is a strictly non-smoking apartment and smoking is only permitted on the balcony. Please note that Laguna La Crete has a strict “No Pet” policy. The complex offers direct access to the beach and lagoon, and has excellent security, with an access-controlled boom gate and 24/7 security presence and patrolling. 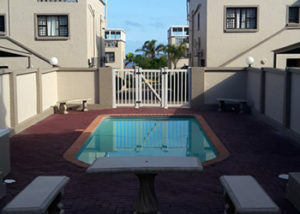 There are 7 communal braai areas as well as a tennis court and a swimming pool, while coin-operated laundry facilities are also provided in the complex. Guests have easy access to shopping centres, restaurants and cinemas, with the Shelly Center less than 5km to the north and Margate 3km to the south. Fascadale Self-catering offers self-catering accommodation in the seaside resort of Margate. The beach and restaurants are ideally located a short distance from the unit. 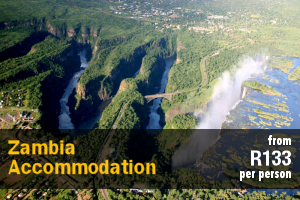 Accommodation is offered in a choice 2 self-catering units which can sleep either 2 or 4 guests. The family unit comprises of 2 sleeping areas furnished with either a double bed or twin single beds while the modern bathroom is seperate has a shower. The second unit contains a double bed while the bathroom has a shower. 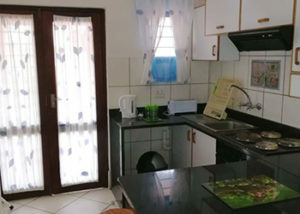 Both units feature a well-equipped kitchen to cater to guests’ self-catering needs while a TV with DStv is also provided. 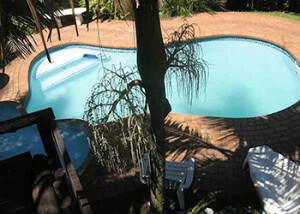 There is a communal swimming pool as well as a braai area on the premises. Secure parking and water tanks are also available. Guests can enjoy swimming, diving, fishing, snorkelling, boating, canoeing, birdwatching and golf in the area. 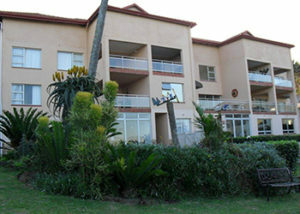 The Beach Front Unit 2 is a very comfortable self-catering apartment in a small 12 unit complex. 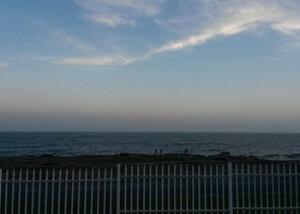 The security complex is situated on the beach front with amazing views. The unit has 2 bedrooms and 2 bathrooms that can accommodate 4 guests. It has a fully equipped a kitchen and the lounge has a DStv connection which offers 50 channels. There is also a dining are fitted with a table and chairs. Towels are not provided. There is 24 hour surveillance camera’s and a lock up garage with an additional parking bay. Free fixed line internet with Wi-Fi. Pets are not permitted. The complex offers a garden with ample braai facilities as well as a communal swimming pool. 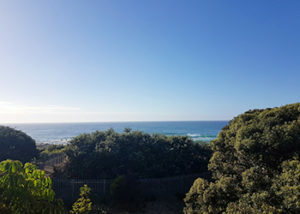 Calamari 10 is a beachfront holiday apartment on a beautiful stretch of Ramsgate North beach with stunning breaker beach and sea views. Walk from your veranda directly onto the beach, only 30m away. The duplex apartment, which sleeps 6, consists of 2 bedrooms upstairs, both with queen-size beds, as well as a sleeping area off the lounge area downstairs. Both rooms and lounge area have amazing sea views and are all fitted with ceiling fans. The apartment is serviced by 2 bathrooms, 1 en-suite with a bath, and the other with a shower, as well as a separate guest toilet. The open plan kitchen is fully equipped with a stove, oven, fridge-freezer, microwave and a dishwasher. The lounge is equipped with a DVD player as well as a TV with DStv. The lounge sliding glass door opens onto the veranda with a braai facility and a large grass area for children to play with direct beach access. There is a single garage provided and the unit is fitted with an alarm and a small safe for valuables. The unit is serviced and all linen and towels are provided, guests are required to bring their own beach towels. There is a washing machine provided as well. 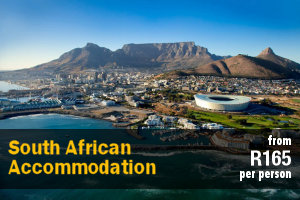 The complex is within walking distance to Ramsgate and Margate’s blue flag swimming beaches as well as the Waffle House and Blue Lagoon restaurants. La Capannina restaurant is 200 m away. 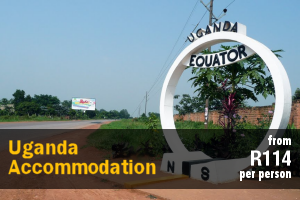 Del Este 5 is a spacious and airy self-catering apartment ideally located in the secure Del Este complex in the popular, sought after holiday town of Manaba in Uvongo. This part of the Hibiscus Coast offers clean sea breezes, pristine natural surroundings, friendly climate, welcoming locals, and delightful sights of dolphins and whales visible directly from the apartment. The apartment can accommodate 4 guests and comprises 2 bedrooms, 2 bathrooms, and a spacious open-plan kitchen, dining and living area. The master bedroom contains a double bed and the second bedroom contains 2 single beds. The first bathroom contains a bath, while the second bathroom is equipped with a shower. The kitchen is fully equipped for your self-catering stay and includes a fridge-freezer, a microwave, a stove and oven, a dishwasher, and a breakfast bar with stools. 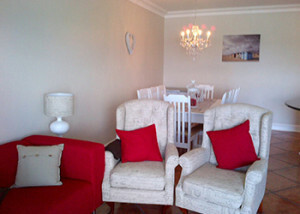 The dining-area features a round table and chairs, and the lounge features a TV equipped with DStv and cosy furniture. The living area leads out to a spacious balcony equipped with built-in braai facilities and patio furniture. 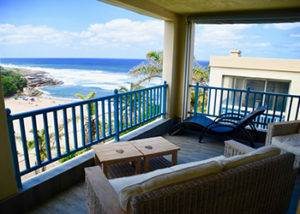 Both the lounge and the balcony boast stunning sea views. The apartment comes with its secure parking bay located next to the front door of the apartment. 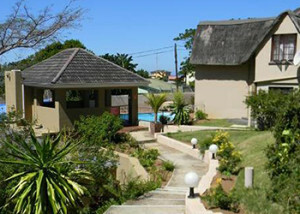 Uvongo Sands 6 is a free-standing holiday home 100 m from the fantastic Uvongo main beach. This beach has a swimming pool, tidal pool, lagoon and waterfall. It is within walking distance of local restaurants and shops. The unit has a nautical theme, spacious 3 bedrooms with fans and 2 bathrooms. The main bedroom has a double bed and an en-suite bathroom. The second bedroom has 2 single beds and the third bedroom has 1 double bed and 2 single beds. There is a well-equipped kitchen with a stove, oven, fridge-freezer, microwave, kettle and washing machine. There is also a comfortable living area with a plasma TV and DVD player. Uvongo Sands can accommodate up to 6 people. The unit is located in a complex, with a remote control gate and own courtyard and paved braai area. It is so close to the ocean you can hear the waves. Please bring along your own bath- and beach towels as none have been supplied. Svea On Sea is a charming holiday home offering comfortable accommodation in Uvongo, a popular holiday destination north of Margate. The house is centrally located within easy reach of shops, restaurants, the business district, and beach. This fully furnished home comprises 3 bedrooms and can accommodate up to 6 guests at a time. The main bedroom contains a queen-size bed and has an en-suite bathroom. There is a double bed in the second bedroom and twin single beds in the third bedroom. These bedrooms make use of a shared bathroom. The cosy kitchen is equipped with a fridge-freezer, stove, oven, microwave, kettle and cooking utensils while additional facilities include a patio with braai facilities and sea views, secure parking and a swimming pool. 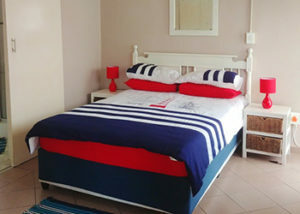 533 on VillaMoya offers comfortable self-catering accommodation in a 1-bedroom apartment situated in the Villa Moya complex in Shelly Beach. 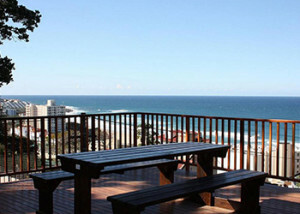 The apartment is conveniently located just 0.5 km from the beach, Shelly Centre and restaurants. The apartment comprises a bedroom with a double bed, a bathroom with a shower, and an open-plan kitchen and living area. The kitchen is equipped with a fridge, an oven and a stove, and cutlery, and the living area is equipped with a TV with selected DStv channels and a sleep a couch accommodating 2 more adults comfortably. 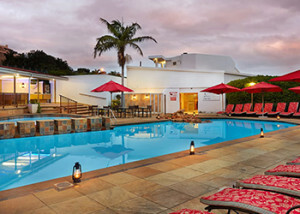 The complex offers a communal swimming pool and braai area, as well as an undercover entertainment area. Guests also have access to 24-hour security and undercover parking. The location offers access to South Coast beaches, shopping malls, restaurants and attractions in the surrounding area. Lake Eland Game Reserve is 45.6 km away and Oribi Gorge Nature Reserve is 34.8 km away. 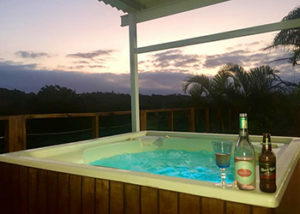 Unit 119 LaGuna La Crete is a 5-sleeper AA Highly recommended self-catering unit, situated in the heart of Uvongo on the South Coast. This beautiful unit boasts an awesome ocean and beach facing balcony for dolphin, whale and boat watching. Private garden, private braai. The property is entirely secured, including electric fencing linked to armed response and we have ample under cover parking. There is a swimming pool, baby pool, jungle gym and a bunny hutch for the kids. Sue Casa offers comfortable self-catering accommodation in a furnished 2-bedroom apartment ideally located on the Manaba Beach coastline offering sea and breaker views, and situated within close proximity to the lifeguarded beach, shops, and pub bistros. Shootershill is a beautiful holiday home on the South Coast for the whole family. It can accommodate up to 8 guests in 3 bedrooms. It has an open plan lounge and dining area with a separate kitchen. Hubbly Bubbly comprises of two self-catering units, the upstairs house accommodates 15 and the downstairs cottage accommodates 8 guests. 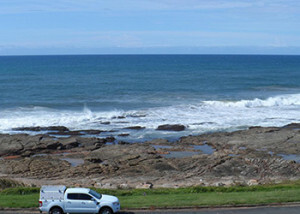 It is ideally situated in Ramsgate the South Coast of Kwazulu-Natal. Sea-Spray Cottages are comfortable family cottages. 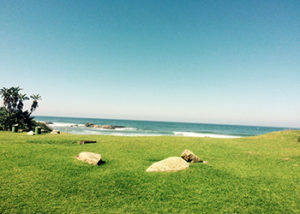 Situated in Margate, Kwazulu-Natal. Perfect for couples, groups of friends or families wanting a comfortable breakaway close to all the action. 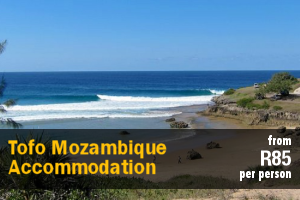 This highly recommended unit is Beach Front and on Uvongo Main Beach, situated in Uvongo a well-known surfing beach. The lagoon offers water entertainment for everyone. There is fresh water baby pool on the beach as well as a tidal pool, restaurants and spa close by. This modern, up market open-plan 3 bedroom unit offers an exceptionally big balcony with the most spectacular breaker sea views, where you can watch the dolphins frolic in the ocean on your doorstep. Periwinkle 1 is modern 3-bedroom apartment, right on the Blue Flag swimming beach in Ramsgate. The main bedroom features a double bed, the second bedroom has a bunk bed and the third room has 2 single beds. 5 Summer Rocks is a stunning three-bedroom beachfront apartment situated within meters from Uvongo Beach. With this proximity to the ocean, you are guaranteed to see dolphins or whales on any given day. 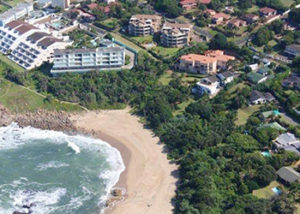 Summer Place 9 is situated in Shelly Beach on the South Coast of Kwazulu-Natal. This apartment can accommodate 8 people and has direct access to the beach. We provide a key for the gate and straight onto the sand. Uvongo Beach Manor Suite is situated on the beach with a full view of the ocean and beach and forever full horizon ocean views. Stylish, executive, spacious, superior on the beach accommodation. 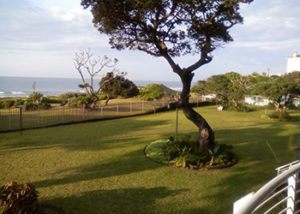 Wake up to breath taking sea views as we welcome you to the exclusive Amble Inn Guest House. The house consists of two bedrooms and two bathrooms. The main bedroom has a queen sized bed and its own private bathroom which includes a shower, bath, toilet and basin. 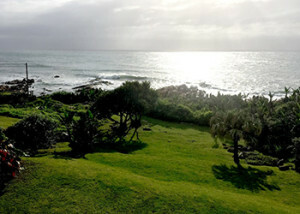 Uvongo Beach Manor 8 is situated on the beach in Uvongo, with the ocean, beach and horizon in full view. This house offers spacious and stylish accommodation for groups of 4 to 8 guests. This is a wheelchair-friendly establishment.